Home > Safety Signs > Mandatory Safety Signs > General Mandatory Safety Signs > Read manual or handbook symbol labels. Finger trap symbol warning label. Hand crush hazard symbol labels. Wear eye protection symbol label. Safety labels. 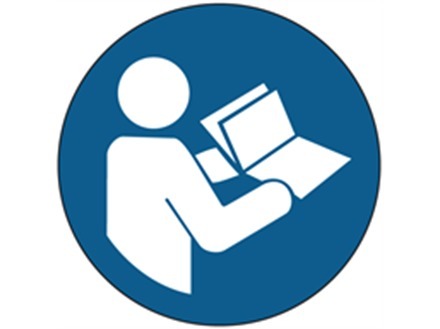 Read manual or handbook symbol label. 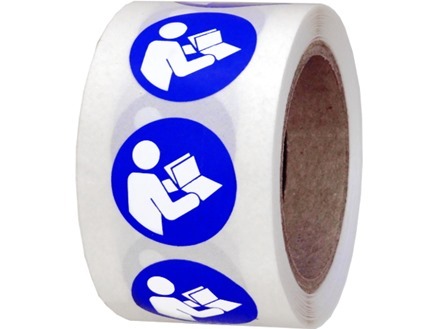 Supplied in rolls of 250 labels. Material laminated self adhesive polyester. Available in two sizes. RoHS compliant. Engineering (mechanical and electrical) labels. Read manual or handbook sticker. High adhesion. Rub test compliant. Waterproof. Operating temperature -30°C to +120°C. Supplied in rolls of 250 labels. EL100 15mm diameter. Material self adhesive polyester, with clear polyester laminate. EL101 25mm diameter. Material self adhesive polyester, with clear polyester laminate.